Brandy joined the Currents team in 2017, and has been thrilled to meet all the patients and their owners. Brandy graduated from the Animal Health Technology program at NAIT in 2001. She spent time in general practice and then a few years in emergency medicine. She moved to Devon, returned to general practice and started her family. Working part time at Currents Veterinary Centre has given her the time to still be involved in her children's school. Brandy lives a very busy family life with her twin daughters, and son, her boyfriend and his 2 children, 3 large dogs (Daryl, Opie and Bella), 2 Russian hairless cats (Fierro and Fiat) and a tank full of fish! 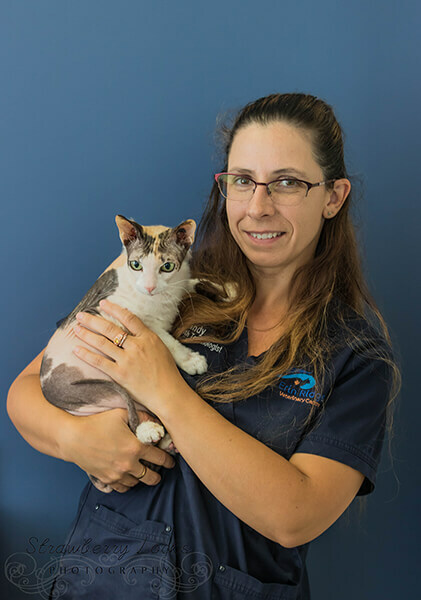 Although Brandy has spent most of her career with cats and dogs, she is enjoying learning about the exotics that come into Currents. Her children love the pictures, and continue to try to convince her to add another pet to the family, of a different species this time!